The book “BreadWinner” was a okay book because it show you how Afghanistan really is. And how the women struggle in Afghanistan they don’t have their equal rights. For example, how Parvana had to do difficult decision and Sacrificing for the family for her life. It tells how Parvana takes a risk to survive to live. This book did inspire me because Parvana is a brave, strong, smart, and loveable ect.. girl. The book ‘The Breadwinner’ is a great book with a great set of characters, a great plot, and amazing character development. The story really shows you just how harsh the world id and how lucky people who live in free countries are. This book was really good. I would rate it a 8 out of 10 because how the author described the way Afghanistan was. For example, the women were kicked out of school and the little girl the book is about (Parvana) can’t go to school either. Although she can’t go to school, and help her family, she does good things for her family. There were a lot of interesting thing that happen in the book and some not so interesting things. She had a lot of drama in her life and she kept on pushing. In the book, Parvana was brave. She did a lot of things other girls wouldn’t do. Hi, my name is Wilson. I read the book called The Breadwinner. The book is realistic fiction about a girl named Parvana who goes through a lot of trouble to help her family. It provides many facts and how she becomes a hero. Parvana is a young girl in her family and very brave. She lives in a bad neighborhood in Afghanistan. She sees the Taliban doing very bad things to people. She knew she needed to help out. This book is very interesting because it shows this young woman become from a little kid to a young adult. She is a hero because she took risk to provide her family with food, water and money. Parvana had some rough time but she had to deal with it. Parvana is a wonderful young woman with a passion for helping and saving her family. Parvana has seen some weird stuff, but she is still a hero. 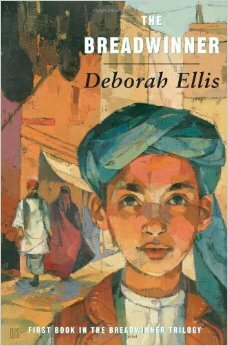 Breadwinner is a good book for students in middle school to read because it teaches you the rights women have in other countries such as Afghanistan. It teaches the differences from our country, America. It teaches you stuff you probably didn’t know before such as women can’t take the bus, they have to walk with a man and can’t go outside without a man . It was very detailed that you can picture what she was saying in your head. Books like this teaches young kids like us how to appreciate because other countries don’t have it as good as we do. Some kids look up to Parvana because she was a brave little girl like Malali. She teaches kids that there’s always hope. i like this book because it’s so interesting. I absolutely love this book. It has such a strong message to it. In addition, people can be aware and wiser on what happens to other countries. Even though it is fiction it has facts on what really goes on over there. Also, you could visualize whats going on in the book. Very few books would give you a clear picture on what is going on. But, “ The Bread Winner” does let you picture exactly what is going on. This book is so inspiring. Best book ever. I give it a 5 !